Last week at Cat Scout Camp in Yosemite I was chosen to join the Order of the Arrowhead. The order is for scouts who go above and beyond in scouting duties. I am SO excited to have been chosen for this honor. The OotA iniation is to spend twenty four hours outside in the forest, at least one mile from camp, with only a lion cloth, egg, blanket, two matches, and your wits to keep you from getting dead. I left camp with sprits high and sense of dread minimal, having prepped as well as I could and carrying the support of my Scout mates with me. I stopped once out of view from everyone to make some minor adjustments. I needed all four paws free but didn’t want to leave my items behind. Remembering my knot tying practice and a PBS special on Mozambique that I watched with my mum, I laid my items down. Opening the blanket, I put my egg and matches in the middle, folded it in half, then in half again. Once my thing were secured, i took one end of the blanket over my right shoulder and the other under my left armpit. I tied it using a bowline knot in the front. Feeling like a Mozambican Mother carrying her baby, I looked at the compass lying in the grass, gave a bounce up and down to test the integrity of my blanket-pack, and hoped for the best for the safety of my egg. It felt sturdy to me. I needed to make a rope to carry the compass. I remember what milkweed looked like from my botany studies, so I set off in search of some freshly dead stuff. Once I found a stand of it that was nice and brown but not grey, I carefully harvested a bunch. I kept all of the milkweed fluff and stuffed it into my blanket-pack. That stuff is great kindling. So, back to the milkweed. I broke off all of the branch nodes, removed the core wood and the bark, and tenderized the fiber with my paws. Using a reverse wrap technique common to bridge builders in the Andes, I made my cordage. Thankfully, the evening dew hadn’t set in yet and everything was still dry. Wet fibers made bad cordage. I stopped when I had a piece of cord about twelve paws long and then hung my compass from the cord and hung it cross-body, same as my blanket pack. I didn’t want anything directly around my neck. I was surely a mile away from camp by now, but I didn’t want to stop until I found water. The stars were out, so I quickly located the North Star for reference. I hiked to the top of a nearby hill and scouted for water. Water looked to be about a half of a mile away. A half a mile through a very dark tree area, in the darkness. I grabbed my compass and determined the appropriate direction, setting off in haste. The sooner I got there, the sooner I could make camp and secure myself for what was going to be a very long night. Along the way, I heard the trilling of a Pigmy Owl. For some reason, it made me think of Einstein and his bugle. A pang of nostalgia bordering on sadness hit my heart. I smiled, shook my head, and reaffirmed my vow to my troop proud. Along the way I added small sticks to my pack, know that I’d need a fire. And when I walked by some fireweed, I helped myself to a meal of it right there and took some with me. I may or may not have carried a larger stick for some protecting and to poke at areas in front of me to determine if it was safe. Not that I was a fraidy cat or anything. I neared the water and started looking in earnest for a place to camp. Yosemite is perfect for camping, so it didn’t take long to find one. I cleared a spot for a fire and, using milkweed fluff as kindling and the smaller branches as tinder, I lit a match. The wind blew it out before I could do anything fiery with it and I let out a hiss. Tossing it into the fire pile, I lit the last match and soon had a comfortable fire. I needed it big enough to light the area for tent building, but small enough to not attract anything vishus. I used the rope from my blanket-pack strung between two trees and the blanket over it to make a tent. Every time the wind blew my tent moved, so I weighted the corners down with rocks. Home sweet home. I looked around and smiled. Home sweet home, indeed. I went to the water and gave my fireweed a good soaking. I didn’t want breakfast to be limp and soggy. I gave my egg and fireweed a safe place to spend the night and laid near the fire for some stargazing. I’d spotted the Milky Way and thought of stargazing with my friends back home. It was then, there, on my back and cozy warm near a fire in the Yosemite darkness that I heard it. Crouched down and peering out the end of my tent, I saw this tiny little thing making its way toward the fire. It looked like some kind of deranged Guinea Pig. My mind was blank. What looked like that and lived HERE? A few moments of watching it inspect the camp site made my nerves calm down and my brain work a bit better. I remembered that pikas lived here. It was a pika! A cute little pika. A cute little, delicious pika. I crept out slowly, stalking the pika. Pikas have great sense of smell, and it didn’t talk long before the pika turned around and looked me squarely in the eyes. I was floored. My dinner was talking to me. She came super close and touched her nose to mine. She was so cute up close, smelling of green weeds and sunshine. There was no way I could have this pika for dinner. She then scampered off into the weeds. Needless to say, I was a bit confused. Giving up on figuring it out, I added some more sticks to the fire to keep it small but powerful through the night. I knew I wouldn’t sleep well and could mind the fire well enough between naps to be sure that it didn’t go completely out. I fell into a fitful sleep and woke for the last time in the shank of the night, right before the birds began to shout their pre-dawn greetings. I went out and stoked the fire for breakfast. I walked away from my camp to take care of some business, and on the way back I picked a few pawfuls of clover. It would be hydrating and tasty with the fireweed and egg I planned to have for breakfast. When I got back to the fire, Morwenna the pika was by it, drying her fur. I fetched the egg and fireweed and set it near the clover pile. Morwenna looked at me and said, in hushed tones, “I love you and I want a pencil.” I looked down at the egg. I had no pencil. She laughed. I was confused. I didn’t get the pika’s humor. I didn’t think I wanted to understand the pika’s humor. I cracked the egg, giving Morwenna the pika the egg white and helping myself to the egg yolk. It turns over that egg white is good for pika fur! We shared the clover and I finished the fireweed. She left as soon as we finished eating. I packed up camp, extinguished the fire, and went for a hike. No sooner did I come into a clearing and realized where I was. I’d camped right near Meow Rock! Walking over to Meow Rock, I found the legendary catnip fields that surrounded it. I couldn’t help myself. After all, it’s CATNIP. I dove in whiskers first and left my cares behind. I lost all track of time. Was it minutes I was in the catnip or was it hours? I didn’t know. A quick catnip scented wash got my head together, and I looked up towards the sun. I measured the paw distance between straight up and the sun. it was eight paws, so about four in the afternoon. I had been in the nip for HOURS. 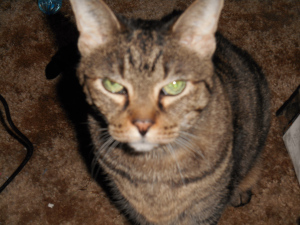 I had one more catnip meal for the road, readied my compass, and started making my way back to Scout Camp. My head was thick and I was very distracted, though, so progress was slow. And then it happened. I wasn’t paying attention and found myself right alongside a field of VISHUS DEER. And they saw me! I had little option at this point. I was a goner. Dead. Kaput. Bought the farm. Shuffled off to Buffalo. Soon to be of this world again only as vishus deer poo. I took my compass off of it’s cord and held it in my teeth. I ran. I ran as fast as I could right at the deer. They scattered, save for one male who stood his ground, antlers held proud. Before he knew what hit him, I was up on his back with the cord around his antlers! I tied my compass to the cord and held on as the deer ran. Here’s a Cat Scout Top Tip: You can steer deer by turning the antlers. It time for the annual Cat Scouts Cardwood Derby! This year, I’m driving with team Furrari. Let me talk yoo through tah car: This MK-II open wheeled racer takes into account the things that did not work so well in the prototype. The axles are run through the body for stability, less understeer, and a lower center of gravity. (Last year they were mounted along the underside of the car in tubes.) Inside are cardboard guards so that the driver’s tail or paws do not get pinched in the axel whilst it turns. The overall weight is less due to the fasteners along the sides. They look like rivets but are made to secure cardboards together. This means there is no tape or adhesive on the body of the car. It’s tough to see in the photos is how glittery the engine block really is, but it is full-on glitter. Wow, what a day! It started with a snowstorm in teh morning. As I wuz getting ready to pick up Miz Lexi, over three inches of snow came down! We made it to teh dance safely, tho, and den we had lotsa gud foods and lotsa fun dancing. Lexi is sooper fun to be wif. 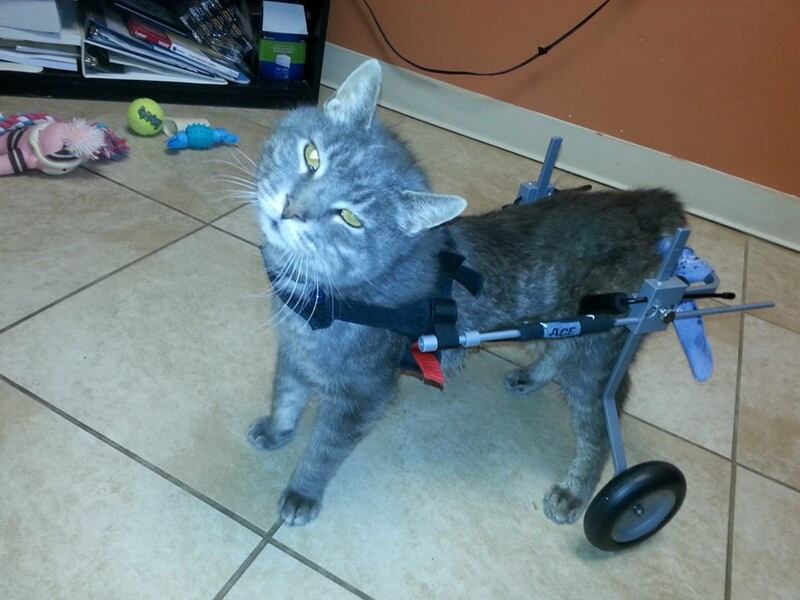 I’m still walking on catnip clouds cuz I had such a good time! On teh way home we were hit wif a surprise blizzard. Teh forecast sed 1-3 inches, but we have closer to 6 and it’s still snowing and teh winds are catarazy! Now I’m off to teh Cat Scouts dance! Round two, heer I come! Another Invitayshun to another dance! How lukky can one mancat get? Well let me tell yoo! 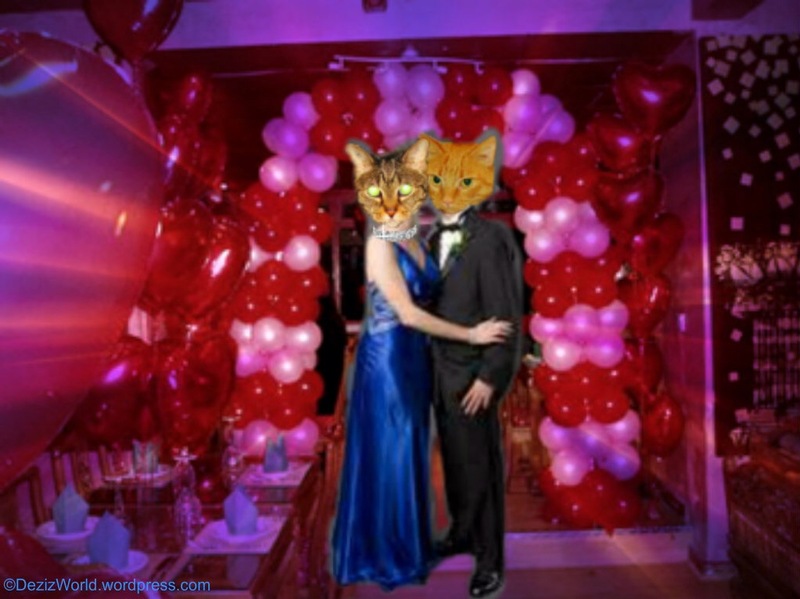 I was just asked to another Valentimes Day dance by a lovely ladycat named Tiger. Mah tabby head is spinning! 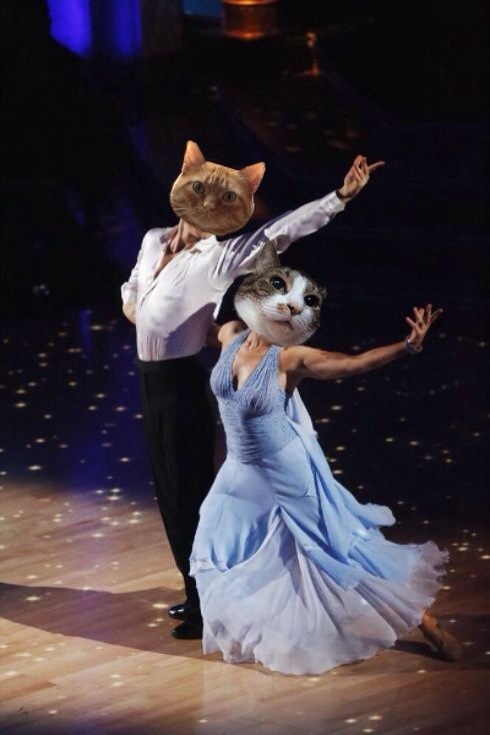 I better get ready for teh weekend and practice sum dancing pawsteps. I am SOSO excitered! 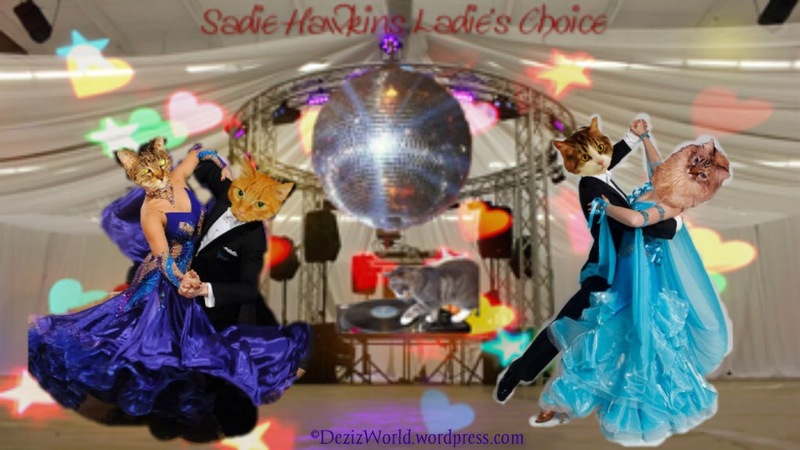 I just got invited to teh Sadie Hawkins Valentime’s Day Dance at teh Tabby Cat Club! I was asked by a luvvly Ladycat named Lexi. I know Lexi thru her sisfer, Dezi. Dezi is a CatScout wif me. 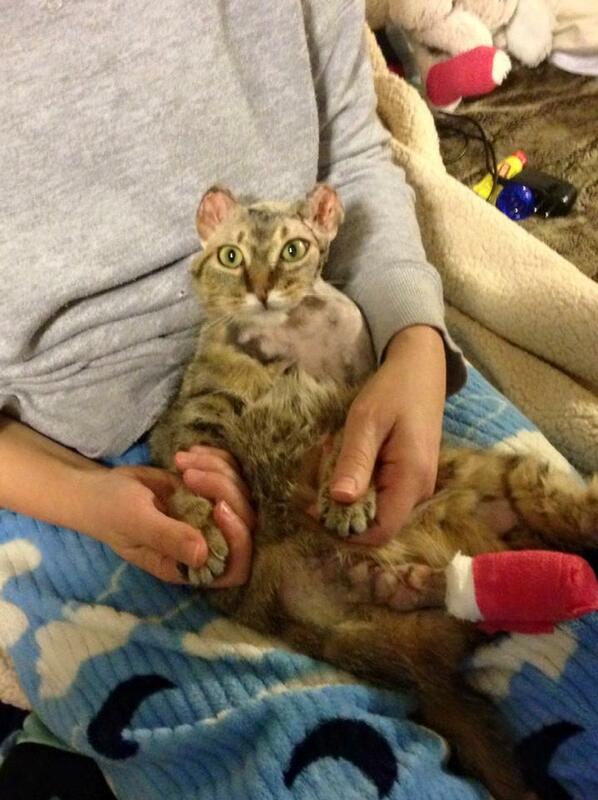 These ladycats have very important jobs as therapy cats! She’ll be sixteen on April 29th! Sorry I hazzent posted in a while. I’ve been making noo friends! Rite now, I have two noo friends who have exceptional storees. I just wanna give so much lubs to these two kittehs. They have loving homes now and get lotsa lubs, but I wanna curl up next to them and purr to halp heal and comfort them. I know dat, for certain, I am a better cat for getting to know them. 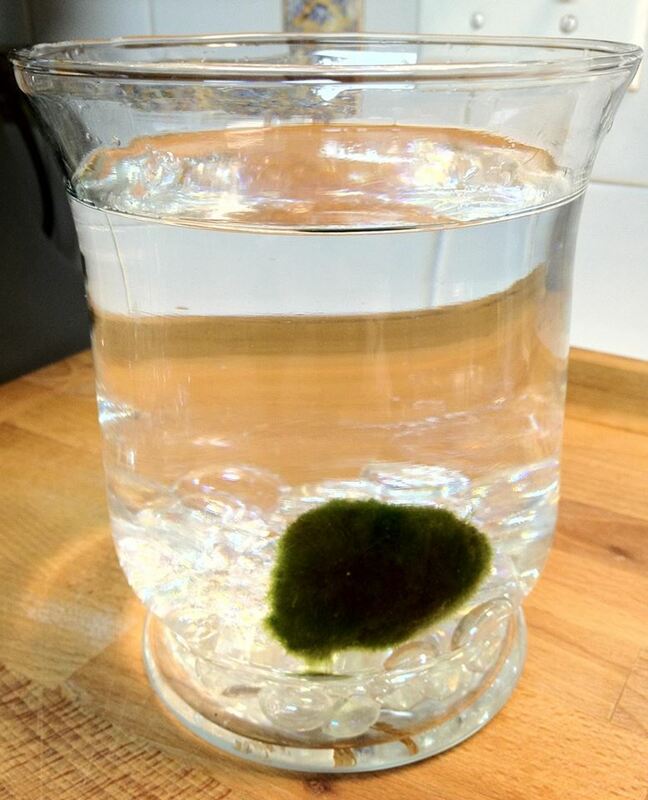 Two weeks ago, I woked up in teh late afternoon to find a furreh green creechur in mahliving room. It smells like teh woods and it’s made of FUR! What’s dat, Mum? Oh? I see. So I just learned that it’s made of FIR, not FUR, and his name is Fraysure. I was weirded out by Fraysure at first. Mum reminded me that Fraysure always sleeps over in our libbing room in December, and that hims is friendly, not skerry, and Not for climbingks. Fraysure is mah friend now; I really enjoy being near hims and often nap on his skirt. I was interviewed by the Funny Farmer Felines for their Funny Farmer Friday Feature on Mousebreath Magazine! OMC! 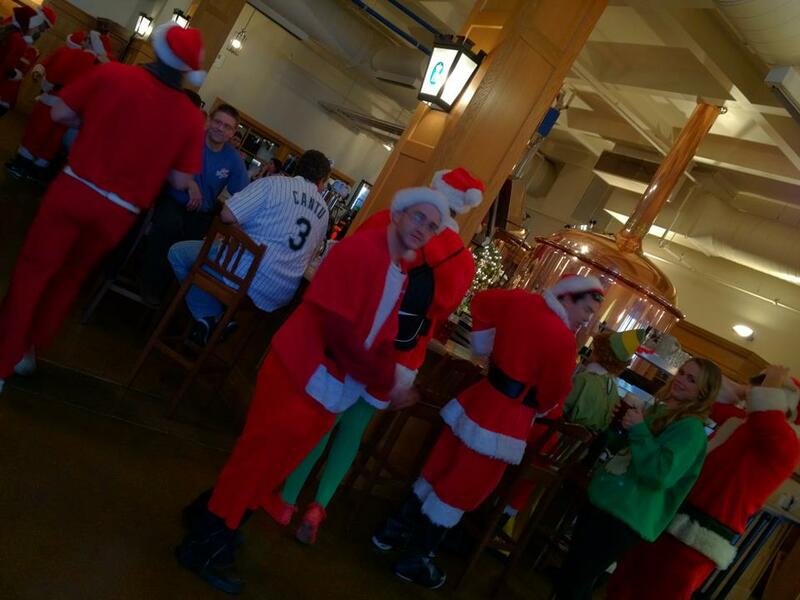 Mum was having lunch when over a hundred Santas, elves, and reindeers walked into teh bar singing Jingle Bells!